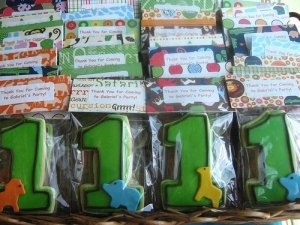 These toddler party favors are geared towards the celebration of your little one's first birthday. 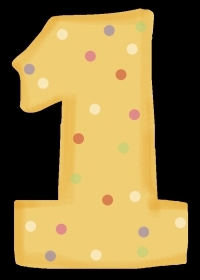 As a birthday milestone, they don't get any more important or special than the very first birthday. The main decision you'll want to make is whether your party theme is going to center around "1" or a specific character/story your child loves. You can actually choose to combine these, for example, if your child loves Elmo you can decorate for his/her first birthday using Elmo as a focal piece. Also, most likely you'll have guests of all ages at a first birthday party. You will probably have children of all ages and a large number of adults as well. It's up to you whether or not you have two different types of favors for the children and the adults. Don't be fooled though, that will be a TON of work! Because you are going to have a million and one other things to get ready on top of the favors, we suggest you create toddler party favors that fit all age groups. Edible. Guests of all ages will enjoy an edible favor! Personalize cookies, chocolates, cupcakes, candies, or mints with your child's name, birthdate, favorite character or theme. Add a thank you message tied on with a ribbon. Photos. Everyone will love to remember your child's first year with a special photo in a keepsake frame. Order the frames customized for your party theme (jungle, princess, etc) or buy little colorful frames at a craft store like Michaels and personalize with your child's name. You can also house the photo in something unique like a keychain, drink coaster, coffee mug, or placemat. Candles. Find votive candles in a color/smell associated with your child. Package in colorful cellophane and tie off with a tag and ribbon thanking guests for sharing your child's special day. CD. Create a CD of your child's favorite songs. For example, one mommy compiled a disc with twelve sun-themed songs because her little girl loved "You are my Sunshine." It was a HUGE hit with all guests! And functional/reusable too. First birthday cookies for boy or girl. 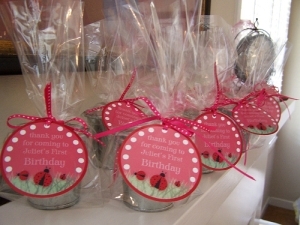 Ladybug theme party favors for little girl's first birthday. 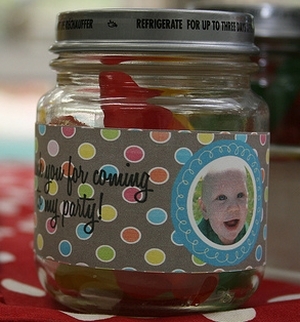 Cute baby jar personalized for first birthday. Visit Sweet Pea Designs for more info. Birthday-in-a-Box has some toddler party favors! If you are looking for children birthday party favors, give them a try. Return from Toddler Party Favors to Home.